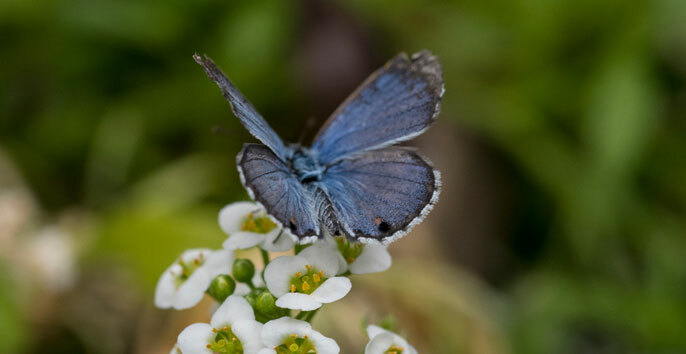 Scientists are raising Miami blue butterflies in captivity and reintroducing them in south Florida. Scientists who work with live organisms often have to move them between locations. This requires knowing what conditions creatures can tolerate well, and also can involve some unusual packing challenges. Here three researchers explain how they transport butterflies, sea turtles and endangered frogs safely between labs and the outdoors. A Sierra Nevada yellow-legged frog. Mountain yellow-legged frogs (Rana muscosa and the closely related Rana sierrae) once were common in lakes, ponds and streams in California’s Sierra Nevada mountains. They were remarkably abundant for millennia, but declined steeply over the past 150 years, after humans introduced nonnative and predatory trout into historically fishless habitats and a virulent pathogen, the amphibian chytrid fungus, spread through the region. By the early 2000s mountain yellow-legged frogs were gone from more than 90 percent of their native range. In 2014 populations in the Sierra Nevada were listed as endangered under the U.S. Endangered Species Act. One way to help mountain yellow-legged frog populations recover is by reintroducing them. Scientists collect frogs from populations that have developed increased resistance to chytrid fungus, and release them into habitats from which they were previously eliminated. How do we keep endangered frogs alive as we carry them several miles through remote and rugged mountains, traveling on foot? The key tools are small plastic cups, bear-proof food canisters and snow. To initiate a translocation, we capture adult mountain yellow-legged frogs from healthy populations using hand nets. After weighing and measuring them, we insert a tag the size of a grain of rice that carries a unique identification number, like those used for domestic pets, under each frog’s skin. Then we place the frogs individually into small cups with perforated lids for ventilation, and load the cups into larger canisters that we carry on backcountry trips to protect our food from bears and other creatures. Finally, each loaded canister goes into a backpack. Mountain yellow-legged frogs once were the most abundant vertebrate in Yosemite National Park, where scientists are working now to restore them. Frogs that are adapted to mountainous areas can easily die if temperatures exceed their upper thermal limit — approximately 80 degrees Fahrenheit (26 degrees Celsius) for mountain yellow-legged frogs — so we pack nylon bags filled with snow around the canisters inside our backpacks. This keeps the frogs cool and reduces their activity and oxygen demand. Finally, we put a thermometer in each canister so we can monitor their temperatures during transport. And then we walk. The terrain is usually a jumble of boulders, snow and trees, but we know the route and wend our way as quickly as possible to the reintroduction lake. When we arrive, we gently unpack the frogs and release them at the water’s edge. Surveys conducted during the past several years show that their numbers are increasing in Yosemite National Park — a hopeful sign that recovery is underway. Butterfly pupae on corrugated cardboard. My lab works to conserve at-risk butterflies, including the small, brightly colored Miami blue (Cyclargus thomasi bethunebakeri). It was once locally common across much of the South Florida mainland and adjacent coastal barrier islands south through the Florida Keys to the Dry Tortugas. Over the past several decades, expanding coastal development has reduced and fragmented the Miami Blue’s habitat, leading to a catastrophic decline in its overall range. Today this endangered species is one of North America’s rarest insects, with only two or three small populations left on remote islands in south Florida. As part of a collaborative conservation effort, we breed Miami Blues in captivity and translocate them to places in their historic range. The adult butterflies are only about the size of a thumbnail, and their slug-like larvae are even smaller. As they grow, however, the larvae tend to cannibalize each other. To minimize this risk, we rear larger larvae individually in small plastic shot cups. Miami Blue butterfly pupae, padded and ready for the trip to south Florida. Our facilities in Gainesville are more than 450 miles from the Lower Florida Keys, where we release the butterflies, so packaging them safely is critical. When larvae in the lab are nearing maturity, we put a square piece of corrugated paper in each shot cup because we’ve learned through trial and error that nearly all of them will helpfully transform themselves into a pupa, or chrysalis, within the tight grooves of the paper. This makes handling and moving them much easier. To move the pupae, we layer the corrugated paper squares in a secure container, cushioned with sheets of soft, quilted toilet paper, which works well and is cheap! Then we can hand-carry or ship the fully packed containers via express carrier to south Florida. There we place the pupae outdoors in small plastic chambers that are specially designed to allow the butterflies to emerge naturally. Early results are encouraging: Butterflies have emerged and mated in the wild. Three endangered juvenile Kemp’s ridley sea turtles and their medical records are prepared for transport from New England Aquarium to Florida to complete their rehabilitation prior to release to the wild. Sea turtles have existed for millions of years, but today they are threatened by interactions with the fishing industry, loss of nesting habitat, boat strikes, oil spills, pollution, poaching, climate change and disease. When injured or ill sea turtles are found on beaches or at sea, rescuers often transport them to veterinary hospitals for care. In Massachusetts, for example, volunteers and staff at Mass Audubon’s Wellfleet Bay Wildlife Sanctuary partner with the New England Aquarium, Turtles Fly Too, NOAA Fisheries, and sometimes the U.S. Coast Guard to transport turtles to and from the New England Aquarium’s veterinary hospital — sometimes by vehicle, sometimes by plane. An established network retrieves cold-stunned sea turtles from Cape Cod for treatment every year. Turtles are ectothermic, or “cold-blooded,” animals whose body temperature changes with the environment around them. This means we need to avoid exposing them to temperatures that are too warm or too cold during transport, and sometimes we need to keep them at a specific temperature. At the New England Aquarium, we frequently receive sea turtles that have stranded on beaches after exposure to cold water, which “cold-stuns” them, making them lethargic and slowing their heart rates. Warming them too quickly can be deadly, so we move them in vehicles kept at 55-60 degrees. Later, when they have been rehabilitated and are ready to be released, we transport them to warm-water release sites in cars, trucks or planes warmed to 75 to 80 degrees. Turtles breathe air, so they can be out of water for many hours – up to 24 hours for some transports from Massachusetts to Florida. We move them in padded boxes, and try to minimize noise, vibration, and visual stimuli that can be stressful. For the past decade we have medically monitored turtles during and after transport events to better understand how the experience affects them. Our work during the Deepwater Horizon oil spill and after several cold-weather events has taught us that transport can be stressful for turtles, so we are investigating methods to reduce the stress, such as allowing turtles to rest for six to 24 hours in saltwater pools at the release site before returning them to the ocean.